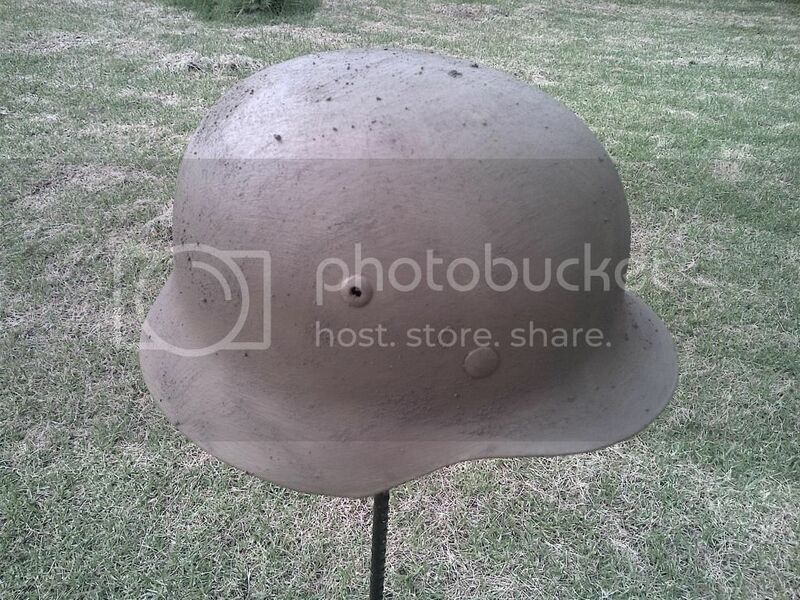 wwii axis reenactment forum • View topic - Show off your reenactment helmets! Post subject: Re: Show off your reenactment helmets! Helmet painting project on a repro 35' lid. I am in the process of having a M40 Q66 stahlhelm restored that has Post-War Norwegian paint.It will have a original metal liner band & exact reproduction liner and chinstrap installed and correct paint/texture..It will be my main reenacting helmet..The repro is getting retiared....I will have pictures posted here as soon as it is finished! @Peiper... a question on the shell..
Is it a little out of shape? 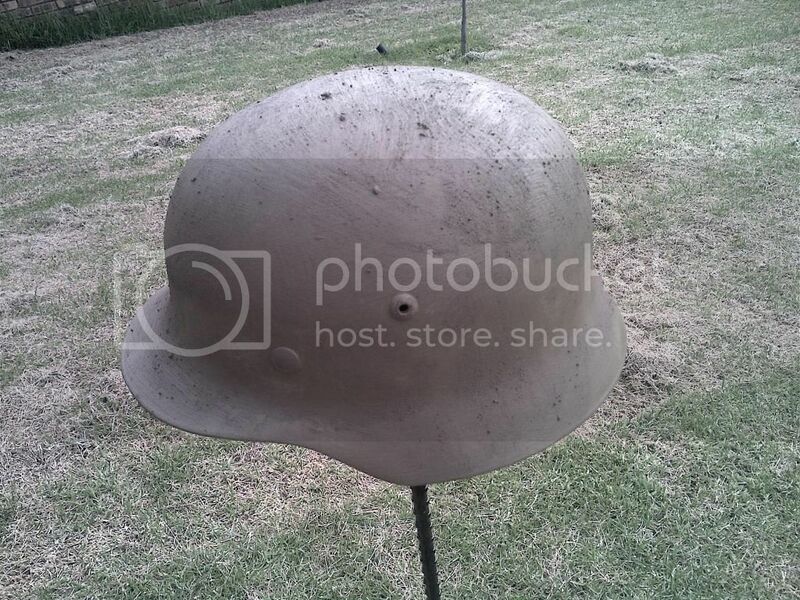 I agree with you on what you said about Peiper's helmet.The runes are way too big on the decal..Originals looked nothing like this....Just a common reproduction....Thanks for posting a photo of a authentic example. That's why i always recommend an original helmet shell. I am getting a M40 Q66 shell restored for reenacting usage.It will be just as it left the factory in the 40's....I am sick of reproduction helmets...Original shells are the best way to go! Here's my original M40 Q66 Single Decal Army stahlhelm I use in my reenacting impression.It has been painted in the correct feldgrau color and real aluminum oxide powder texture,"Bigfoot" style Heer decal (very common on Quist made helmets).Original WWII German metal liner band (DRP 1943),Exact reproduction leather liner and chinstrap. If you suggest that Pre 1945 there was only "single" twist chickenwire, you are wrong. Back in 1901, 2 patterns where patented in the Netherlands, a double and a double twist. So, either would be accurate. But why so rusty? Been on a chicken coop since 1902. Last edited by peiper1944 on Tue Feb 04, 2014 10:38 pm, edited 1 time in total. Anodising is a treatment for alluminium. If you're going to waffle,atleast know what you're on about. I'm certain Erik knows what he's on about, have you seen the man's collection of original kit?! ?